My first customer! 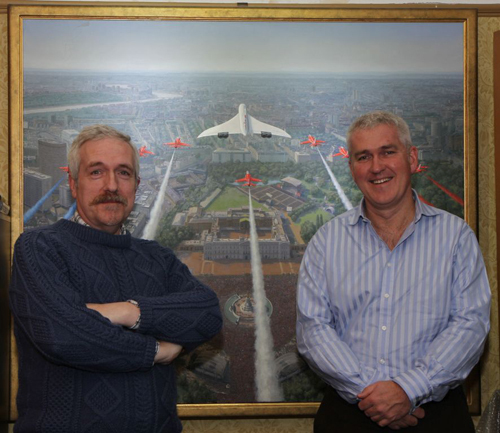 This is Justin Hughes, one of the Red Arrows pilots who flew on that Jubilee day in 2002, who not only kindly signed these prints (along with his colleagues) but who also bought the first multi-signed print. We’re standing in front of the original painting. These days the phrase ‘limited edition’ has been abused and over-used, particularly for things that are only limited by the numbers that can be sold, but the true origin of this phrase came from the world of art. Here, a limited edition of prints means exactly that – it is strictly limited in number; once the declared number are sold no more prints will ever be produced anywhere in the world. It is a traditional way that artists made their work available to those who can’t afford original paintings but who think that an open-edition (i.e. unlimited) print is worthless. A truly limited edition-print that has been signed and numbered by the artist has a value and intrinsic quality that means that makes it special. Such prints can also increase in value over the years and they are valued by collectors and connoisseurs accordingly. In the case of ‘Jubilee’ there are two separate and complementary limited-edition prints available of this unique painting.